Joan Barreda and Ricky Brabec in one part of the world, and Kevin Benavides and Paulo Gonçalves in another, were the stars of an action-packed weekend which concluded with victory in the United States and second and third place finishes in Chile. Monster Energy Honda Team continue to collect prizes during the preparation programme that will ultimately culminate with the team’s main season objective: the 2018 Dakar Rally. This weekend saw the team come away from two separate competitions with noteworthy results: the Atacama Rally, in the arid Chilean desert and the Vegas-Reno, which links the two Nevada state cities in the United States. 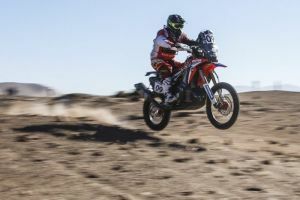 Kevin Benavides, with two stage victories, finished the Chilean rally – the third date in the FIM Cross-Country Rallies World Championship – in overall runner-up position. The Argentinean was in the battle for the leadership throughout the entire six-day event (five full stages and a prologue), although local rider Pablo Quintanilla – current world champion – managed to sneak the top spot on the final day. Portuguese team-mate and brother-in-arms at the Atacama Rally, Paulo Gonçalves, fell victim to a sanction for speeding at a check-point in the first stage, that proved to be an insurmountable burden throughout the rest of the rally. In the end Paulo was rewarded with a hard-earned place on the final podium. Monster Energy Honda Team had managed to place both of the duo on the Atacama Rally rostrum. In the overall standings of the FIM Cross-Country Rallies World Championship, after the Atacama Rally, Paulo Gonçalves holds third overall place with options for a final podium finish, whilst Kevin Benavides makes a leap in the general rankings to fifth position after the runner-spot in the Chilean race. DOMINANT DUO IN THE U.S. Meanwhile, Brabec and Barreda dominated the longest offroad event in the United States – the Vegas to Reno. By the end of the 864 kilometres (539 miles) course they had opened up a margin of over fifteen minutes over the nearest rival. Brabec had previously taken the top prize in 2014, while Spaniard Barreda made history last year by winning the twentieth edition of the most prestigious offroad U.S. race. The Honda CRF450 RALLY made it thanks to a combination of the riders’ efforts, the teamwork of JCR-Honda and the direct support from American Honda. Frenchman Michael Metge was also present as reserve rider. Johnny Campbell, manager of the team in Vegas to Reno race, said: “I am very please with the outcome of the 2017 Vegas to Reno for our team. Every one of our team members played a key role to this win here in Nevada. Once again, Joan and Ricky proved they are the team to beat and the CRF450Rally is a great weapon for this style of race. I want to thank Taichi Honda, our Team Leader and Joe Parsons from Monster Energy for giving me the opportunity to put this effort through the test here in the US for the second year in a row. Next week the riders and crew move on to the Argentinean city of San Juan to take part in the fourth date in the FIM Cross-Country Rallies World Championship calendar. The team will take part in its entirety as the preparation for the forthcoming Dakar 2018 continues.